I-Class Fleet Destroyer ordered from Yarrow's at Scotstoun on 30th October 1935 under the 1935 Build Programme. The ship was laid down on 12th February 1936 and launched on 11th February 1937 as the 2nd RN warship to carry the name. It had previously been used for a Trawler hired in Aug. 1914 but wrecked in the Firth of Forth in November that year. Build was completed on 24th August 1937 after delay due to delay in delivery of gun mountings. The contract price was £259,371 but excluded Admiralty supplied items such as weapons and communications equipment. 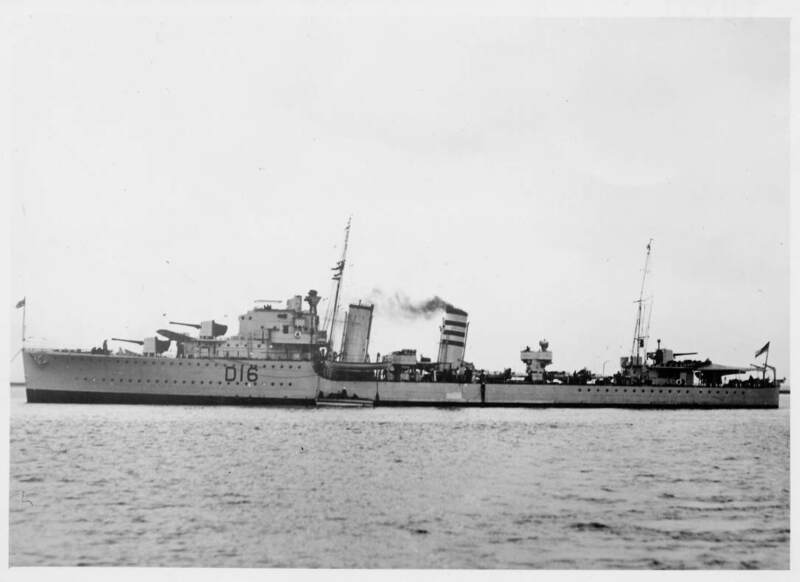 This Class of destroyer was designed for use as minelayers (See BRITISH DESTROYERS by E. March and The Naval Staff History (MINING) for more information). Badge : On a Field White a withered oak eradicated black. September Deployed in Mediterranean with 3rd Destroyer Flotilla. 3rd On passage from Alexandria to Malta. Transferred to Western Approaches Command for anti-submarine duties in SW Approaches. 14th On arrival deployed for anti-submarine and patrol duties. 18th Unsuccessful search for U29 which had attempted a torpedo attack. October Deployment in SW Approaches in continuation. There were no survivors from the submarine. November Transferred to 5th Destroyer Flotilla for duty in Home Fleet. 14th Taken in hand for refit by HM Dockyard, Sheerness. Nominated for service with 20th Destroyer Flotilla for minelaying duties. December Under refit and conversion. See references. 12th After work-up for minelaying duties joined Flotilla on formation. 13th Completed Heligoland minelay with HMS INTREPID (Operation ID2). and on 22nd February, two destroyers LEBERECHT MAAS and MAX SCHULTZ. There were no survivors from any of the three. See above reference and WARSHIP LOSSES OF WW2 by D Brown.). 14th Reverted to anti-submarine role when all minelaying operations were suspended. 27th Torpedo tubes and gun mountings replaced at Portland. 3rd On completion took passage to Scapa Flow for duty with Home Fleet. 6th Deployed on interception patrol in NW Approaches and North Sea. 17th Intercepted German tartar ALTMARK which had British merchant navy seamen on board. Force enemy ship to enter Norwegian coastal waters in Josing Fjord. For details see ENGAGE THE ENEMY MORE CLOSELY by Corelli Barnet. March Home Fleet duties in continuation. collision with the fishing trawler OCEAN DRIFT. 27th Nominated for duty in Force WV for minelaying operation off Norway. Detached to convert for minelaying duty in HM Dockyard, Chatham. April Passage to Scapa Flow after conversion. 3rd Joined Force WV for lay of field off Norway in Vest Fjord (Operation WILFRED). 6th Sailed to execute WILFRED with HM Destroyers ESK, IMPULSIVE and ICARUS. 8th Laid minefield and joined HM Battlecruiser RENOWN off Narvik. (For details of all minelaying operations see Naval Staff History (Mining). Contact was lost to weather conditions. 10th Carried out anti-submarine patrols off Narvik. Later rescued survivors from HM Destroyer HARDY after 1st Battle of Narvik. ENGAGE THE ENEMY MORE CLOSELY and Naval Staff History (HMSO-2001).). Skelfjord by HM Destroyer ESKIMO. 15th Returned to Scapa Flow. May Norwegian support deployment in continuation. Pennant Number for visual signalling use changed to I 16. 15th Resumed duties in 20th Destroyer Flotilla. 16th Deployed for off Dutch coast for minelay with HM Destroyers EXPRESS and ESK. of field in East Coast Barrier. to ensure shipping avoided the new danger area. series of minelaying operations in the East Coast Mine Barrier. shipping from attacks by surface warships ships and submarines. 21st Carried out lay in Barrier (Operation BS6). 26th HMS IMPULSIVE withdrawn for evacuation duties at Dunkirk (Operation DYNAMO). 28th Detached to assist in evacuation of BEF from Dunkirk (Operation DYNAMO). and Naval Staff History (HMSO-2003).). Passage to Join Dover Command. Rescued troops and survivors from HM Destroyer GRAFTON. 31st Passage to beach head and embarked 1,290 troops for return passage. 1st Embarked troops for return to Dover and on return passage came under air attack. Sustained casualties and major damage and fatal casualties including 21 of ships company. return to Dover using third boiler room. Taken in hand for repair by HM Dockyard, Sheerness. 28th On completion took passage to rejoined Flotilla at Immingham. 29th Prepared for minelaying operation. August Carried out post repair trials on completion of repair work. Following an enemy report the ships altered course to westward of the laying position. structure, lowered seaboat to rescue survivors. when ship detonated a mine and steam was lost..
be maintained. Inspection revealed ships back was broken. had to leave the area. torpedo from HM Destroyer KELVIN in position 53-26N 03.45E. For full details see Naval Staff History (Mining). This was the most disastrous and costly minelaying operation.